The Coastal Stars Youth Hockey program is committed to the protection of our players both on and off the ice. Our goal is to be fully compliant with USA Hockey's recent adoption of SafeSport Program. All of our coaches will be required to participate in training per USA Hockey's guidelines. Above that, we are also requiring our board members and staff to partake in the training. We also welcome and encourage any parent who would like to take the training to do so as it is available for free to all USA Hockey registrants. If you are not currently registered with USA Hockey, you can register as a volunteer for no charge at www. usahockeyregistration.com. Your will need your USA Hockey registration number to access the SafeSport training videos. The tests at the end of each section are optional and not required to complete the training. The safety of it's participants is of paramount importance to USA Hockey. USA Hockey SafeSport is the organization's program related to off-ice safety. USA Hockey has long had systems in place to protect it's participants from physical abuse, sexual abuse and other types of abuse and misconduct that can be harmful to youth hockey players and other participants. These include without limitation Physical Abuse, Sexual Abuse, Screening, Locker Room Supervision and Hazing Policies, in addition to Codes of Conduct applicable to administrators, coaches, officials, parents, players and spectators. 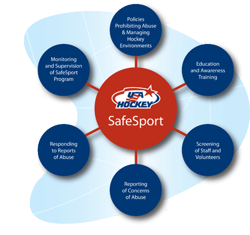 The USA Hockey SafeSport Handbook is intended to update and collect USA Hockey's various policies to protect its participants from all types of misconduct and abuse.